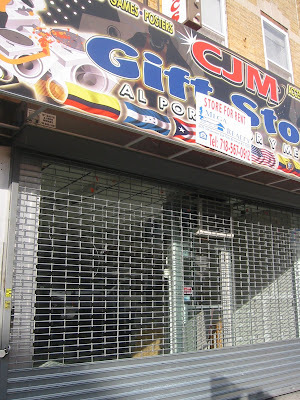 With the closure of one of the gift/music/electronics shops on 5th Avenue (this one on the corner of 45th Street), another one will be opening just across 45th Street! 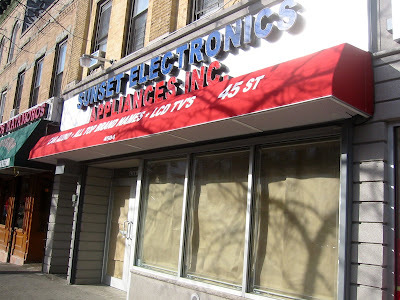 The large commercial space that used to house Pollo Campero will be split between the new and in full swing Amalgamated Bank and the yet-to-open Sunset Electronics Appliances Inc. Don't confuse it with 49th Street Electronics and Appliances, also on 5th Avenue. The awning states there will be car audio (much used in Sunset), LCD TVs, and all the top name brands. I wish them well, but the amount of store fronts closing or that have been trying to get rented out seems to be rising. The new Lechonera seems to be holding its own, so maybe they'll do well. The Lechonera owner is the same owner as the grocery store/meat market that was in that space. The owner decided it made more sense to open a restaurant of that caliber to cater to the "non" mexican residents of Sunset Park.